The PML Co-Pilot altimeter or Transolve P6 or the Adept ALTS25, Transolve P4 or Transolve P5 altimeter. However, you`ll also need to order the compatible mounts for those altimeters, CPR2K-FAM and CPR2K-AAM, available on the CPR3000 Page, as the CPR3000 system comes standard with mounts for the P6 or Co-Pilot. 4F (FFFFg) black powder for the ejection charges..
(NOTE: A CPR-based rocket must always be flown with the electronics installed. 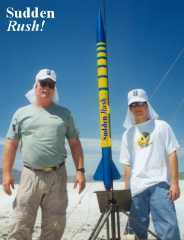 A CPR-based rocket cannot be flown with motor-based ejection). his kit is one of a series of high performance rocket kits using our CPR3000 system! The Sudden Rush has been flown many times at HPR launches nationwide and has a proven track record of successful Close Proximity Recoveries in windy conditions! This popular rocket includes the Kwik-Switch motor mount, 0.093" thick G-10 fins, a tail cone and of course, the CPR3000 Dual-Deployment Recovery System.